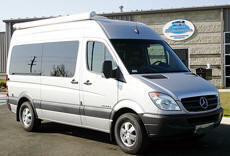 This incredible 170" Extended Mercedes Sprinter looks like it is straight out of a luxury lifestyle magazine. With a one-of-a-kind design, this vehicle is made for luxurious nights on the town, cushy family vacations, and all the big college football games. The couple that commissioned this build worked hand-in-hand with CMI to make sure that there would never be a cooler vehicle in sight. From the custom exterior, done entirely in metallic silver, to the 50" LED TV, the completed project is truly a masterpiece. 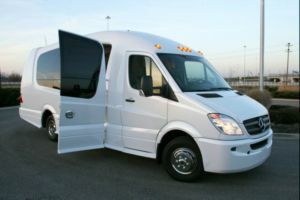 The vehicle's exterior features chrome accents, a custom front bumper with parking sensors, sleek fiberglass running boards, and a 13-foot side awning. As beautiful and classy as the exterior is, the interior and rear tailgating areas are the real gems. In the driver's area CMI added plush carpet flooring, custom Ultraleather captain's chairs, and in-dash stereo with every feature under the sun, and an authentic aluminum dash kit. The end product is an area where any passenger, or driver, would love to spend some quality time. Behind the driver's area is where the fun truly begins. Four captain's chairs are mounted 2+2 and can be swiveled around in multiple arrangements. Three of those four seats have their own individual aviator tables for snacking, working on a laptop, etc. 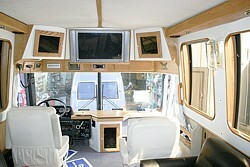 Overhead, on the driver's side, the interior has spacious upper cabinets for clothes, movies, food, etc. Rearward of the captain's chairs there are two aisle-facing sofas for lounging and relaxing. These Utraleather sofas are supremely comfortable for traveling, and they add the flexibility of turning into a full-width bed for longer trips. These passengers also have extensive entertainment options on-hand while traveling down the road. Press a button and a 32" LED TV folds out of the ceiling behind the driver and passenger seats. 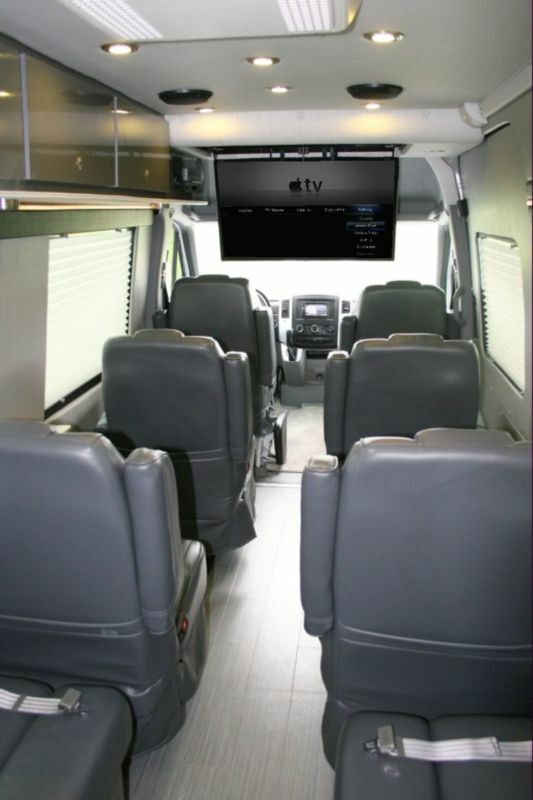 That TV allows everyone aboard the opportunity to watch DVDs, In-Motion satellite, laptop inputs, and the kicker, Apple TV. Via an onboard internet connection, passengers are able to sync their iPhones, iPads, etc to the TV for access to their iTunes movies, Netflix, etc. The entertainment can all be heard through multiple channels on wireless headphones, or through the massive 10-speaker Rockford Fosgate sound system. The vehicle gains some additional creature comforts beyond the seating areas. 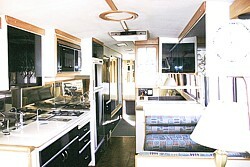 The rear of the interior includes a sizable enclosed bathroom, and a galley area. The bathroom features a recirculating toilet good for 45+ flushes, as well as enough room to change clothes, etc. The galley has a sink, direct trash drop, and a custom ice-chest to keep beverages ice-cold. CMI also built a custom Corian bar that holds the family’s favorite spirits and is removable for use outside the vehicle. Once outside, the vehicle’s back end readily transforms. 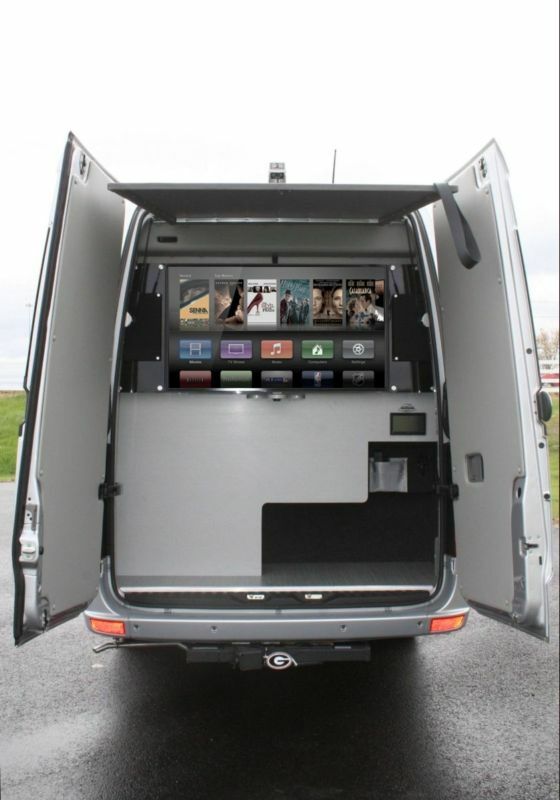 Open the rear doors, and initially you will not see much, just a nicely-finished storage compartment. Pull a tab and a custom collapsible rear awning deploys. The awning not only shades people, but also acts as a sun/rain blocker for the gigantic 50” LED TV. This TV has access to all of the same sources as the interior TV, but can be chosen separately. It too has its own Apple TV for easy streaming from your phone, the web, or an iPad. The rear also features its own sound system with custom, back-lit speaker enclosures for a little bit of show. 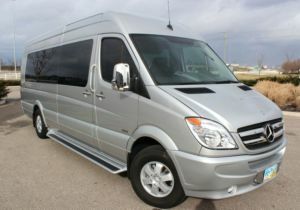 Couple those features with plenty of luggage room and you have the perfect “trunk” for trips or game day.